The Doughty Sisters, Dorothy and Freda Doughty, probably did more to ensure the future prosperity and stability of the Royal Worcester factory than any other Worcester artists or modellers. Born in San Remo, Italy, Dorothy and Freda were the daughters of Charles Doughty, the English poet and traveller (The author of ‘Arabia Deserta’and the inspiration for Lawrence of Arabia ). They came to England when the sisters were still children and settled in Sissinghurst in Kent. Charles Doughty died in 1926 and the Doughty sisters, neither of whom had married, carried on in the same house by themselves. Freda Doughty ran childrens modelling lessons from the house always full of bright, hopeful and cheerful boys and girls. 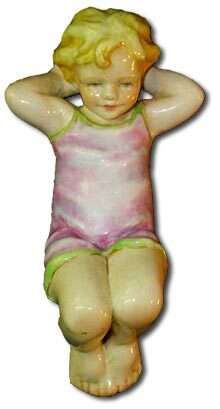 She would frequently use them as live models for the ceramic figurines that she fired in her own kiln. 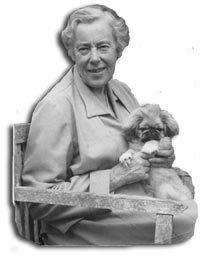 Dorothy Doughty studied at the Eastboune College of Art where she became a keen naturalist and ornithologist and would paint plasticine models of local bird life. The late 1920s were not a good time for Royal Worcester. In an attempt to reverse their financial difficulties they decided to invest their efforts in the production of a brand new range of figurine and animal studies. Following the employment of various freelance modellers ( Baker, Bray, Cane, Crofts, Lindner, Stabler, Williams and Freda Doughty ) an exhibition to show off the new figures, was set up in a London Art Gallery. Freda Doughty’s models of young children at play were thought to be old fashioned, both by modellers and the factory workforce. They looked out of place compared to some of the more ‘avant garde’ almost abstract figures produced by many of the others at the show. However, people decide what they buy and they took Freda’s little children to their hearts. Freda Doughty’s models sold in good numbers whilst many of the other Worcester pieces remained unsold. 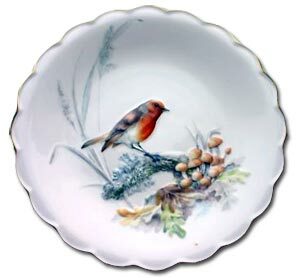 In 1934 Royal Worcesters art director, Mr Gimson, approached fine art publisher Mr Alex Dickens about producing a series of service or cabinet plates featuring images from the ‘Audubon Birds of America’, book. These were to be issued in a limited edition and although a totally new venture for Worcester, it was a roaring success. Following the Audubon plate series Mr Dickens approached the company about producing a series of natural studies of American birds in their native settings. The birds had to be realistic figures and he insisted that they be done in a matt finish to maintain that realism. Mr Gimson agreed with the idea and, even though the idea of a matt finish was an unusual one, said that the Worcester factory could do it. Freda Doughty had by now released many more models, all eagerly accepted by the public, and had become one of the most successful Worcester artists. Her output was almost entirely figures of small children at play but as a very versatile sculptor Mr Gimson approached her about the preliminary models in the American birds series. Whether or not Freda Doughty felt up to the task is not recorded but she introduced Mr Gimson to her sister Dorothy explaining that her knowledge of birds, artistic skills and memory for minor detail would make her the more obvious choice for the job. Dorothy Doughty was not used to producing models for later ceramic production and Freda had to show her how her own plasticine models were cut up to produce the required moulds for slip casting and how the pieces were then put together again. 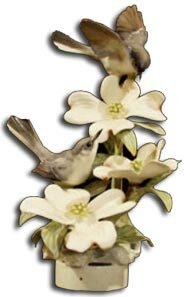 There was no thought, at this time, of Dorothy making life studies and her first model of Redstarts on Hemlock had to be produced from photographs of the birds and flowers. The outcome was adequate but lacked the vibrancy of her later models and only 66 pairs were ever made. Dorothy’s next pair of birds, American Goldfinches on Thistle, were an improvement. 250 pairs were made and they were good enough to make Mr Gimson and Alex Dickens continue with the series. However, it quickly became apparent to Dorothy that the slip casting method of manufacture, while ideal for the birds themselves, had its limitations when used for the delicate flowers and foliage that had to accompany them. Dorothy Doughty was on a steep learning curve and spent a great deal of time at the factory watching and talking to the craftsmen there. The answer to her problem came when she met Antonio Vassalo, a Maltese craftsman who was turning out beautifully delicate little flowers and leaves by hand moulding. Antonio Vassalo was the only person at the Worcester factory capable of making these little masterpieces. Mr Gimson was reluctant to give his services over to Dorothy’s line of birds but he recognised the importance of the series and eventually agreed. A new workshop was set up and a group of new trainees employed to learn his techniques and Dorothy’s imagination and artistic talents were free to go on to greater heights. Her next models Bluebirds on Apple Blossom and others were produced in ever greater detail and and it took all the skills of one of Royal Worcesters finest artists, Harry Davis, to come up with the colour combinations that would fire to the right blend of tones. Three other pairs of birds were introduced before the start of the war, each more intricate and realistic than the last. Each set was limited to 500 pairs and they were selling well. Many of them to went American Natural History Museums who were to build up complete sets of her works as the years passed. 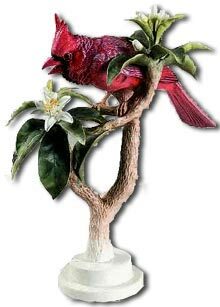 The bird figures were very expensive, the manufacturing costs were high because of their complexity and there were, obviously, only a limited number of units to spread this cost over. But the idea of having a limited edition issue was appealing to the public and the high cost may have even been welcomed as a valuable part of their exclusivity. The principle of the limited edition was being taken up in other areas as well with models by other Worcester artists like Gertner, Lindner, Stabler and others all being released, some to better affect than others. Freda Doughty was asked by Mr Gimson to produce one or more limited editions of her child figures but Freda steadfastly refused. Her figures did not have the ‘specialist’ appeal of most of the others concerned and she wanted her children to be affordable and available to everybody. Worcester Limited editions may have been the money spinning idea of the moment but mass appeal still very much had its place in the market. The onset of war practically wiped out normal production at the Royal Worcester factory, much of their time was diverted to war work and many of the staff joined the armed forces. But the Doughty birds continued, although at a slower rate, as sales to America were considered to be a valuable part of the war effort. Dorothy Doughty also made the first four model ‘standards’ for a series of British birds for the home market but these were not put into production until some time after the end of the war. Dorothy was also heavily involved in war work of her own. She was an ambulance driver and involved in secret experimental work with aircraft production as well as producing the models for her birds. Details are not known but she fell ill ( possibly Tuberculosis?) during the early to mid forties which necessitated a family move to the hills around Falmouth in Cornwall. This affected Dorothy for some months but she would not be swayed from her production of figures and had a garden studio where the walls were lined with cages for the birds she studied. Following the war she made the first of several field trips to America where she would either wander around alone or join organised birding tours, of which she was to build up a good fund of funny stories that she would relate to the factory workers. As Dorothy’s experience and confidence increased she seemed to delight in making her bird figures more and more complex. As if she was challenging herself and the factories craftsmen, to devise new techniques to imitate natures subtleties. One particular model, the Magnolia Warblers, was much bigger than usual and presented great problems in the firing. Numerous attempts were made to produce the first ‘standard’ but repeatedly all the major pieces would split in the kiln and it was almost decided to scrap the project altogether as being impossible to make. Bob Bradley, the master mould maker at the time, was given permission to do whatever he thought prudent in one last attempt to successfully fire them and this he did by cutting small holes into the bigger pieces to allow the heat compressed air inside to escape rather than split the pieces apart. He was the agent in charge of their sales and two figures in particular were done at his behest. One, a single Indigo Bunting on a twig was designed to be simple and cheap to produce and sell. Dorothy rebelled against this until a compromise was reached and she was allowed to put a couple of small leaves onto the twig to add a little realism. The model was not well accepted as part of the group and very few were sold. The second was a pair group of Bob White Quail. Alex wanted something that would appeal to a different market and as these were popular with the American hunting fraternity he again wanted a simple to produce and cheap to make figure. Again they failed miserably but on this occasion it was probably Dorothy’s fault. She wanted to make them more natural and appealing and put a couple of babies alongside the hen bird. The hunters did not like the idea of the birds they shoot being shown with their young and only a very small number were made. These are still very beautiful figures and have great appeal to the other bird lovers but they are, of course, exceedingly rare. The study of the birds, the making of the original plasticine and acrylic resin models, the cutting up and mould making, and all the other myriad of processes that had to be gone through to produce the Doughty birds meant that there was a long time delay between the first concept and the release of a particular model. To help speed up this process the factory brought in Ronald Van Ruyckevelt specifically to help her. He would spend time with her in Falmouth and then supervise the factory side of the process to take some of the load off of Dorothy’s shoulders. Later, of course, he was to produce many spectacular models in his own right but at the start he was highly instrumental in speeding up the process of manufacture and with his help many more models came on stream. With Freda Doughty being responsible for over a hundred different figures and Dorothy’s output of birds not falling far short of that number. Their skills and enthusiasm were almost certainly a major factor in the Worcester companys survival and the Doughty sisters will be remembered by lovers of ceramic figurines for a long long time to come. In 1962, Dorothy was taken ill again and she died at the age of 70. Many of her models were still in the design stage and these models were released by Royal Worcester for a further six years until they were all finished. Freda Doughty continued in good health for another ten years but was to release no more models of her enchanting children. Royal Worcester Doughty Sisters Figures for Sale … Find great deals on Worcester blue and white, fruit painted porcelain and Royal Worcester figures in our Worcester Porcelain Store.